The days of actually sharing Building Information Models are finally upon us. At Ideate we're seeing a high degree of RVT sharing going on out there, not only across A/E disciplines but also into the construction field. Obvious hurdles still abound as we struggle to define BIM deliverables and what constitutes a "constructability" model but it's exciting nonetheless to see so much progress in the past two years.As we see more owners and contractors performing detailed takeoff analysis derived from Revit models we've become more attuned to the unique challenges of trying to leverage someone else's data. It's difficult enough to "walk through" a project you are not familiar with, and even more difficult to comfortably assess the data behind the model when you yourself are not the creator. To that end, I thought I'd share a few tips to help avoid some of the common mistakes that can be made when using Revit for quantity takeoff purposes. Phasing and Schedule Data Challenges Architects and Engineers most typically use phases to graphically represent demolition, existing, and new construction conditions within a project. This allows, for example, items that are existing to be shown in a lighter lineweight, and items that are being demolished to either be displayed as dashed or not be shown at all. Ideate has had many support cases where quantity takeoffs were not giving the expected results due to phasing considerations. Using the wrong Phase Filter on a Schedule can radically impact the takeoff results. 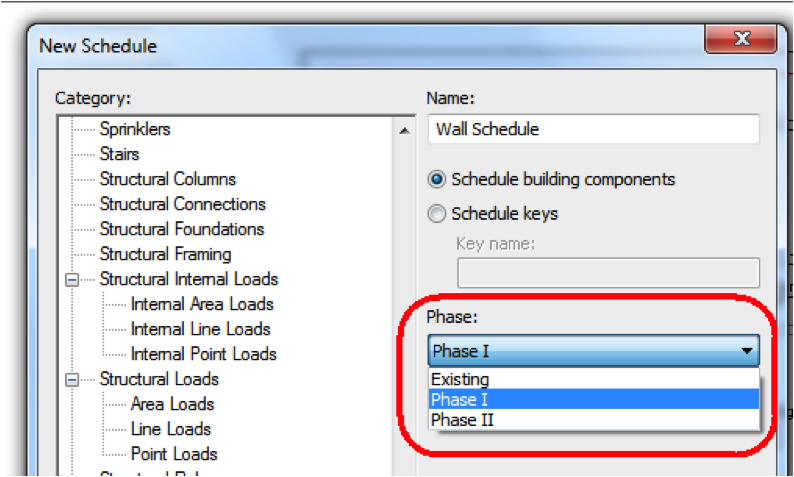 Each of Revit's model elements are assigned a Phase Created and Phase Demolished value, as shown. 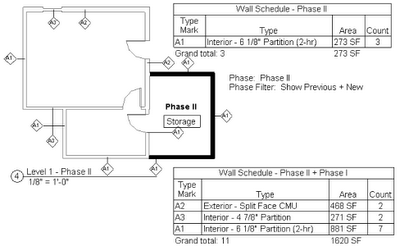 These assignments give Revit the ability to display Views and Schedules as a snapshot in time. When the schedule is created a Phase is identified, as shown. This acts as a filter on the schedule. 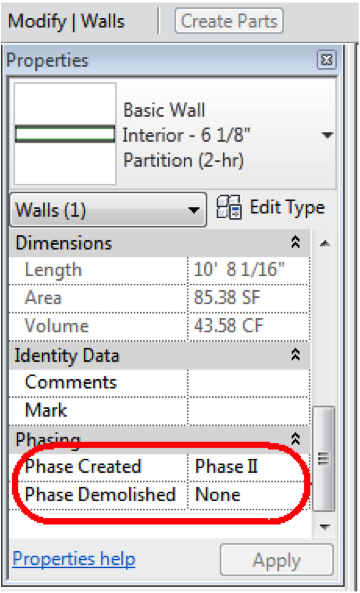 In this example, any Wall that has a Phase Created value of "Phase II" will not display in the schedule. 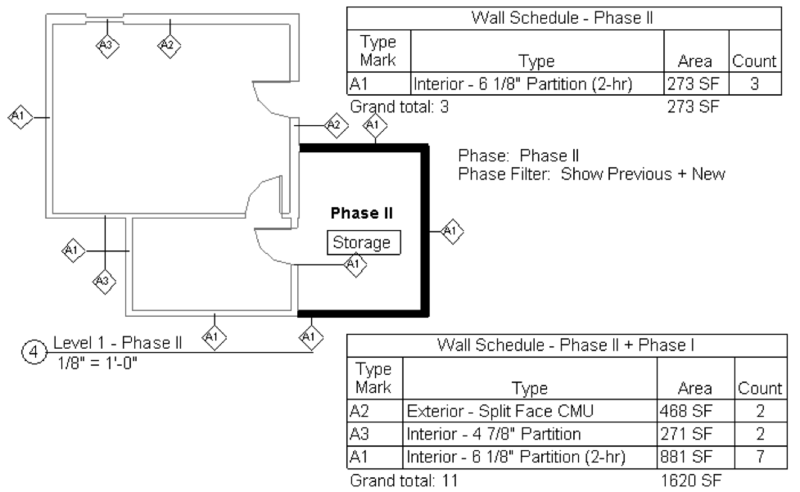 Consider the simple floor plans shown for Phase I and Phase II of the same project. Each schedule has a different combination of Phase and Phase Filter settings. These phase settings can be edited from the Properties dialog when the Schedule is the active view. Note that the temporary wall, shown dashed, is visible in both the Floor Plan View and in the Schedule. Depending upon the Phase Filter the temporary wall could be excluded even if the Phase is set to "Phase I." Additionally, this schedule includes walls that are existing. Is this desired for your takeoff?In Phase II, another room is created. 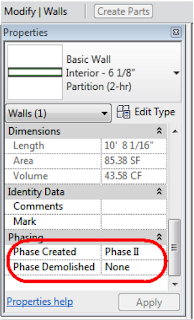 The Revit Schedule, when set to Filter on "Phase II" can include only the items created during this Phase OR can be set to show both the new items and the older items. The Phase Filter called "Show Previous + New" will cause the Existing, Phase I, and Phase II items to display. It cannot, however, be used to only show Phase I and Phase II items and it will also not include any temporary items from the previous phase. Start by reviewing the Phase settings which can be found on the Manage tab under Phases. Review both the Phase and Phase Filter Settings to understand the lay of the land. In order to get a complete picture of the elements on a per phase basis, you may want to have a Schedule for each Phase and use only the "New" Phase Filter. Additionally, while not as prevalent, Design Options present the exact same set of issues with respect to quantity takeoffs. 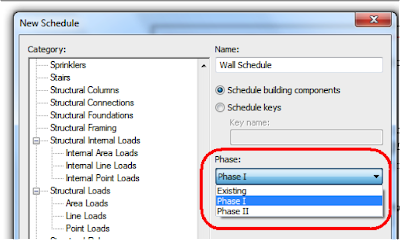 Revit Schedules may or may not reflect information about the set of data upon which you should be basing the takeoff. 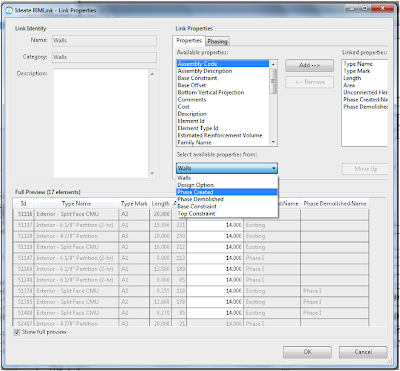 Design Option data creates duplicate elements. In some instances the Design Option data may actually be old and not relevant to the bid. The best course of action is to review the Design Options directly with the architect or engineer prior to starting the takeoff. Lastly, Ideate BIMLink can provide peace of mind to the quantity takeoff process by including the relevant phased and design option-based information in-line with the element data. In this short Quantity Takeoff and Phasing video you'll see how Ideate BIMLink can represent all element instances. You can then use Excel to decide which elements should be part of your takeoff. Learn more about Ideate BIMLink. Want more information on Phasing or Design Options? Ideate offers custom online training during convenient lunchtime hours on these and other construction-related topics. Review the online Revit training topics then contact Ideate's Training Department for more information.